The Vancouver condo market continued to slow in July. While part of this is seasonal a trend, there’s definitely more to it this time around. Condo sales have declined each month this year, and fell to their lowest total for the month in six years. 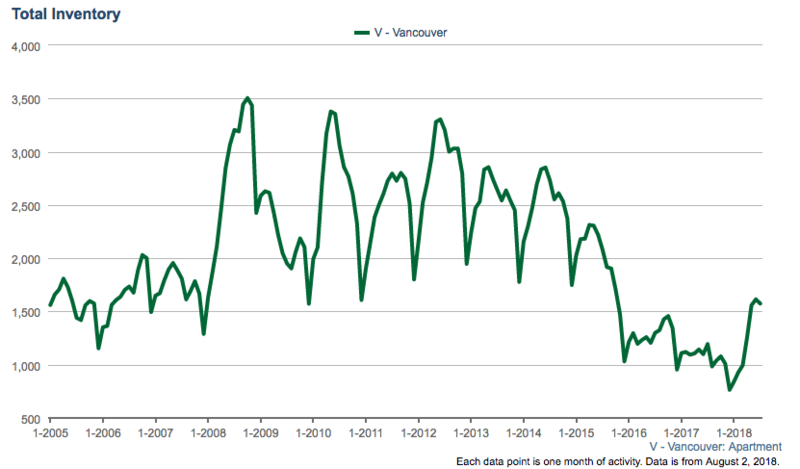 Overall, Vancouver condo sales declined by 22% on a year over year basis. The one bedroom condo space remained the strongest, but was not immune, with sales dropping 19%. Two bedroom condo sales dipped 24%, while three bedroom sales plunged by 31%. For further context, the 427 condo sales this month was 20% below the ten year average for July. 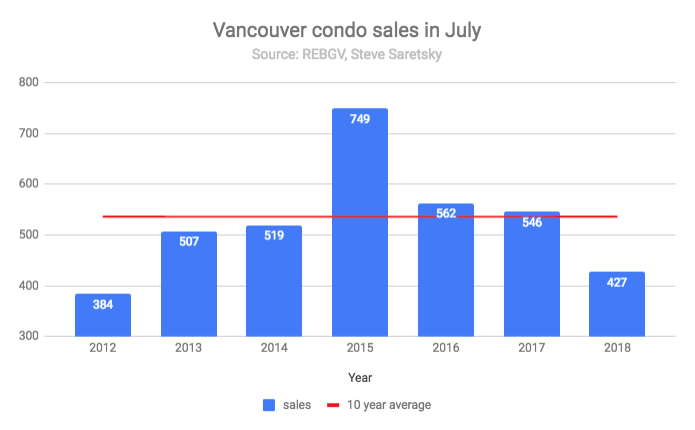 Vancouver condo sales in July. With sales dropping off and new condo supply beginning to hit the market, inventory has been taking the escalator up. For sale inventory climbed 32% year over year in July, pushing inventory to a three year high for the month. Condo Inventory remains low despite recent gains, which has helped cushion the recent slowing of sales. Despite the slowdown there’s no reason for sellers to panic, and they haven’t, new listings increased by 4% on a year over year basis, ticking in near historical averages. While bidding wars appear to be a thing of the past, prices are still holding up relatively well. 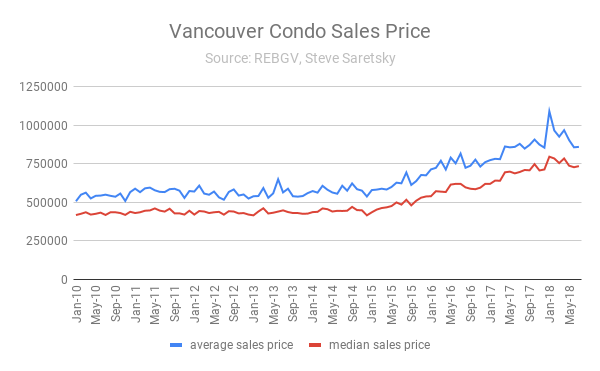 Prices clearly peaked out in the beginning of 2018 and have since dipped below those peaks, with the typical condo down about 5% in recent months. Recent price declines for the most part have yet to show up in year over year data, with the average price per square foot still registering a 4% increase on a year over year basis. The average sales price, however, dropped 2% year over year, while the median price increased 5.5%.